A verse from today’s Gospel (Mt. 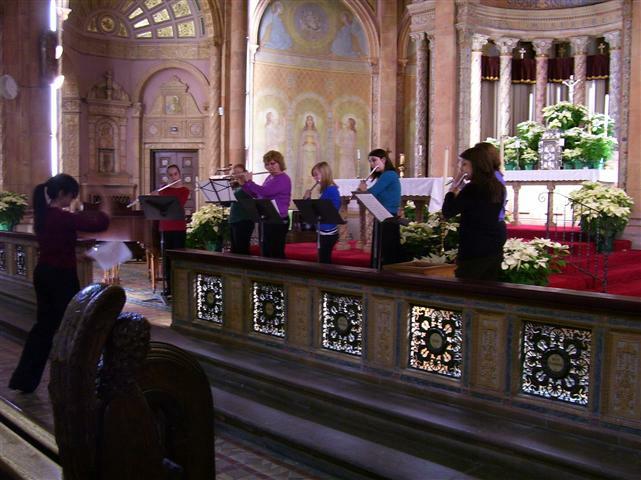 15:26) is repeated in the ceramic medallions on the church altar rail, pictured here in a photo of the Buffalo Flute Club in recital at Blessed Trinity. The Latin words “Vere Panis Filiorum Non Mittendus Canibus” are taken from Christ’s exchange with a Canaanite woman who seeks healing for her daughter. When the church was built, the Eucharist was offered to the people kneeling at the rail. While Christ used these words to test the woman’s faith, “they are applied here in the sense of never to deprive anyone…of the blessings of the Eucharist….” Rev. Walter Kern’s “Guidebook to Blessed Trinity R.C. Church,” pp. 31-32. Thursday, August 21 at 8:00 p.m. ~ Bingo will be played in St. Charles Hall. Saturday, August 23 from 10:30 a.m. to 12 Noon ~ Helping Hands Food Pantry in St. Charles Hall. Saturday, August 23 at 8:00 p.m. ~ Bingo will be played in St. Charles Hall. Monday, August 18 ~ Communion Service at 11 a.m.
Special Collection on August 23/24 ~ As the Catholic Church in the U.S. is looking for ways to respond to the plight of migrants and refugees in our country, our own community response,Vive, is being forced to cease operation. Founded 30 years ago by the Leadership Conference of Women Religious, Vive has assisted 90,000 refugees to either obtain legal status in Canada or move ahead on the path to U.S. citizenship. In a August 5th letter to all parishes in the diocese, Bishop Richard Malone explained that “[i]n recent years all government housing money has been taken away and the congregations of Sisters find themselves unable to bear the burden of support.” As a result, Vive will close its doors on September 30, 2014. The agency, located on nearby Wyoming Avenue, “has an urgent financial need to provide for its current 60 refugees as they are placed elsewhere and to close down the building.” A special collection will be taken at parishes throughout the diocese on the weekend of August 23/24. The refugee crisis is not a world away. It is right here in our neighborhood. Please be generous. Summer in the City ~ Congratulations to Dan Korchowsky who co-ordinated our efforts in making the August 10th “Summer in the City”celebration by the Catholic Churches of Central Buffalo at St. Lawrence such an entertaining experience. 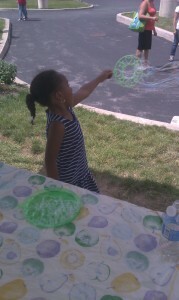 We were blessed with a perfect weather day and an overabundance of delicious desserts contributed by our parishioners. Many thanks to all who donated and participated. St. Margaret’s Parish Picnic/Tailgate Party on the front lawn of the Church, 1395 Hertel Avenue, Buffalo, on Sunday, August 24. Featured is a chicken barbeque dinner by Krolick’s. Tickets are pre-sale. For further information and to purchase tickets, call Mrs. Pat Fenzel at the rectory: 716-876-5318.